Neosho, Mo. – For the past few weeks, the low, rolling hills surrounding this small Ozark community have reverberated to the roar of the United States' largest rocket engines undergoing static tests at Rocketdyne's facilities a few miles away. Recently ordered into production, these engines, which are now rolling off the assembly lines, will power the Air Force's Thor IRBM. Click image for a 2296x2429 pixel version of this image in a new window. 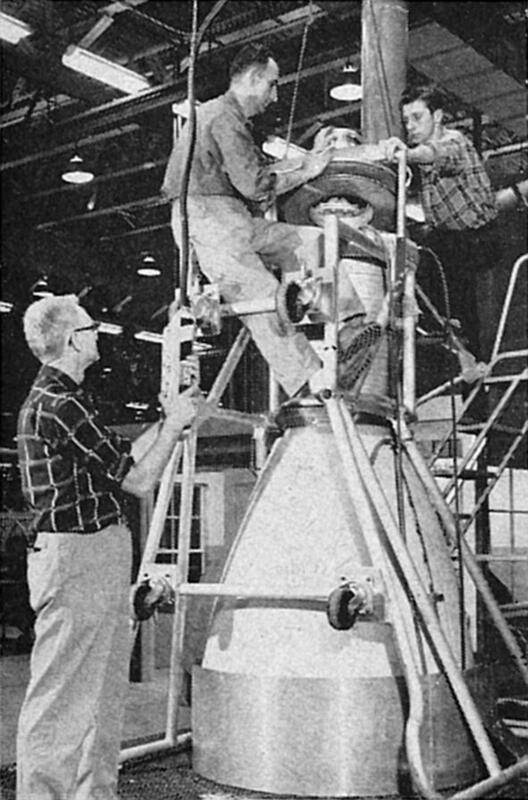 The 150,000-lb thrust engine for the Thor IRBM is subjected to a hot firing at Test Stand 1 on Rocketdyne Neosho's test facilities. Engines are currently being produced at Rocketdyne's nearby fabrication plant. Each engine is run for 15 to 30 seconds in a "sample" qualification test before delivery to BMD [heroicrelics: the Air Force Ballistic Missile Division]. Rocketdyne Neosho's development from initial facilities layout to delivery of the first production engine is a story characterized by the same demanding urgency as development of the intermediate range ballistic missile itself. Seven months after DOD approval in November 1955. Rocketdyne delivered the first model of an entirely new engine system. 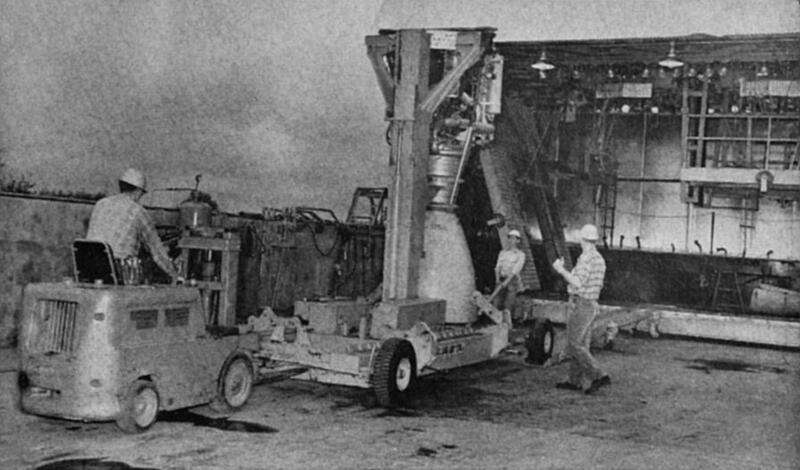 Three months later, the first production model was delivered – three months before the first missile launchings in January, 1957. A simplified and improved model of this new high thrust engine is now in quantity production and testing – little more than a year after the ground was broken for the 200-acre test site. The 228,000 sq. ft. manufacturing plant and nearby supporting test facilities is located on 1,785 acres of the old Ft. Crowder reservation lands. The plant now employs about 1,500 – almost double the employment figure of six months ago. 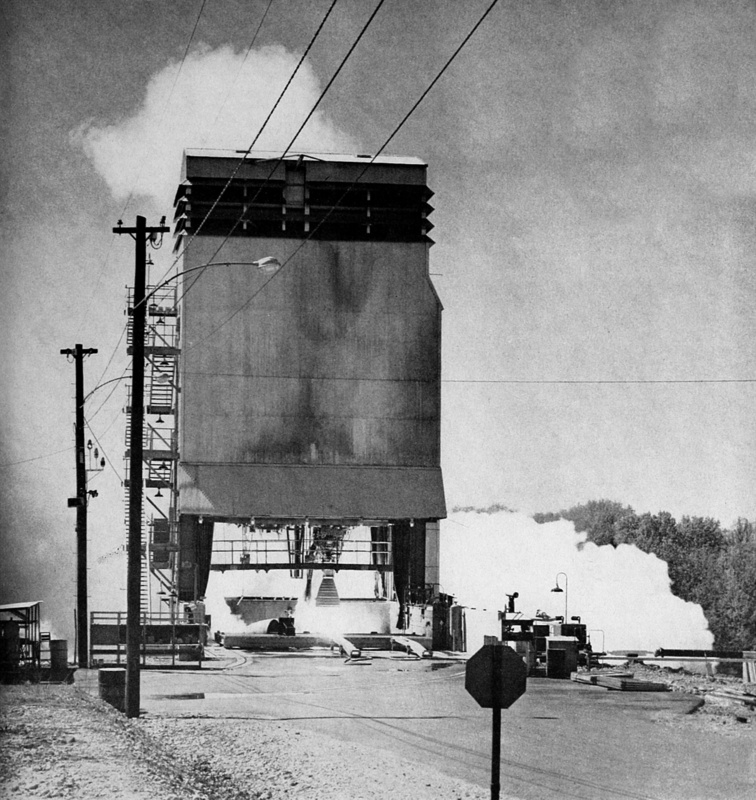 Construction on the facility – started by Aerojet – was taken over by North American when the Air Force decided that Rocketdyne would operate the plant. 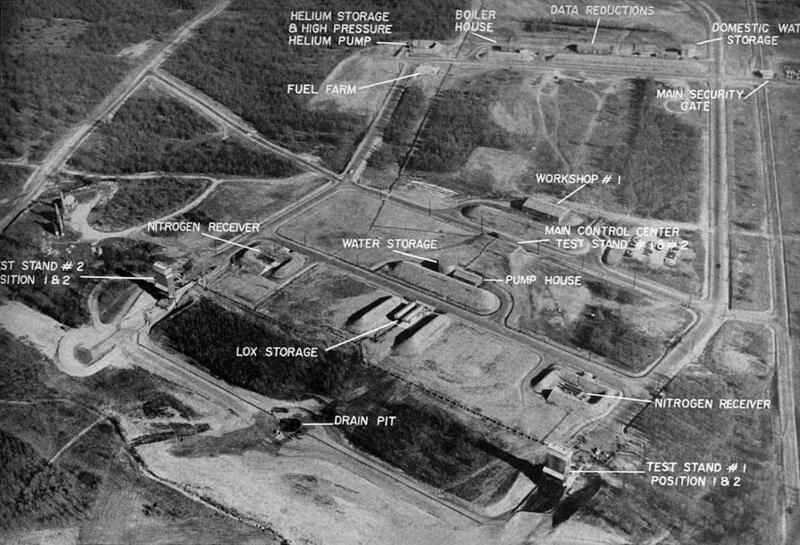 The test area is located about two miles from the administration and production areas. Major items of the test complex are the two high-thrust test stands, each capable of handling two engines. 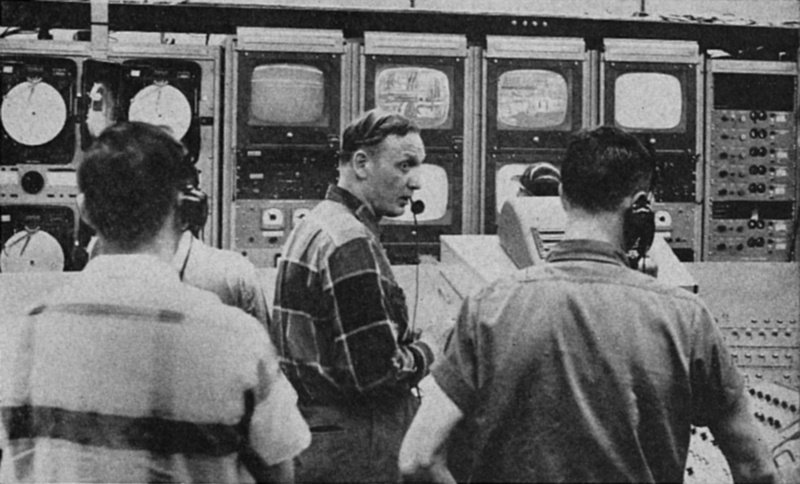 The stands are operated from a reinforced concrete control building equipped with batteries of electronic recorders and remote TV receivers. Extensive earth revetments provide protection for personnel and isolate propellant and test stand areas. The test area has its own water supply and distribution system. Engine fuel is stored on the base while the liquid oxygen is trucked in from Tulsa, Okla.
Click image for a 2284x1554 pixel version of this image in a new window. ROCKETDYNE NEOSHO'S THOR thrust chamber test facilities cover 200 acres of Missouri hills. A major portion of the engines are hot tested for cycles ranging from 15 to 30 seconds. After several engines have been tested, the test stand is recalibrated with a 110-second run which approximates the total burning time for flight operations. The entire propulsion system, less the two vernier engines used on the Thor for added control, is mounted for each test. Propellants are pumped into the system by the power plant's gas generator system. Click image for a 1390x816 pixel version of this image in a new window. ENGINE IS JOCKEYED into position on test stand floor for attachment to mounting brackets prior to a captive test. 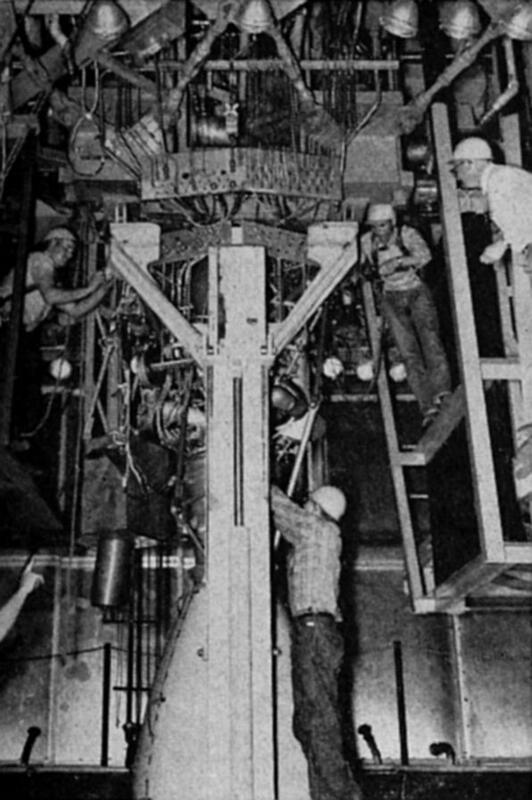 The hinged platform, background, is raised when the engine is in place to give work area for stand crew during final operation. Click image for a 706x1061 pixel version of this image in a new window. AFTER THE ENGINE is raised into a vertical position by the transporter trailer, the stand crew attaches the chamber to the thrust measuring brackets, and connects the many hydraulic and instrumentation lines and tubes of the stand system. Click image for a 1396x839 pixel version of this image in a new window. 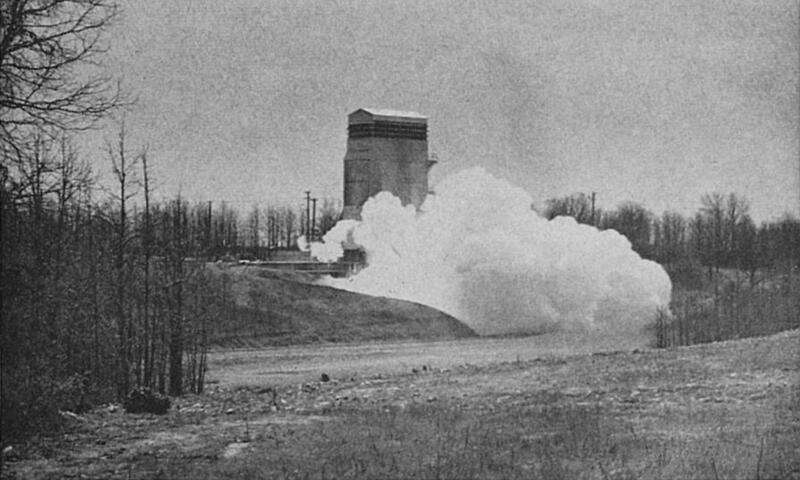 START OF HOT FIRING of Thor engine on test stand # 1. Steam, formed by cooling the hot gases of the engine and gas generator, soon blankets the surrounding area. Visual observation of the firings are made from a point several hundred yards distant. The engines are subjected to a hydraulic flow test before transportation to the test area. Water, under 1,000 psi pressure, is forced through the more than 300 nickel tubes [heroicrelics: the actual number is 292] which make up the walls of the regenerative cooled thrust chamber. The tubes are secured in position by soldering, and held together with steel bands, welded at intervals to the outside of the chamber for rigidity and absorption of internal pressures. The water tests locate any holes accidentally produced by the welding operations. Click image for a 669x1015 pixel version of this image in a new window. THOR THRUST CHAMBERS are calibrated with 1,000 psi water flow tests before leaving the fabrication area. Gas generators and vernier engines for the Thor are tested at a separate facility that has been in operation since the first of the year. Test facilities currently operating on a two-shift status, are reported to be adequate for the present production schedule. Click image for a 1396x844 pixel version of this image in a new window. PREFIRING CHECKOUTS are made from this remote control room. Several hours are sometimes involved in the countdown check. Hot firings are observed with television receivers and recorded by banks of instruments within the control room. The contents of this page, in their entirety, were reproduced from the July 7, 1958 issue of Missiles and Rockets , available on archive.org. Since these magazines are freely available on archive.org, I assume that the copyright has been transferred to the public domain.